Chelsea is a 10 months old female lab who LOVES the water. She extremely playful and very labby, but also very strong so needs teens or large 10 and up kids. 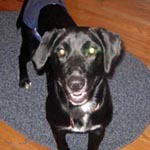 She is crate trained and almost house trained, loves to chase a ball and play with squeaky toys. She needs a family to love and train her. Laney came to the shelter with her sister Lilac but they look nothing alike except for their docked tails. Laney looks like a Boxer mix, is approx. 12 weeks old and weigh about 20 pounds. She is lovable and playful. This gorgeous Shephad/lab pup came into a rescue in WV with their mama. He is easy going and have been exposed to kids, cats, and dogs. A fenced in yard is required for families with children. Angel is a young female Border Collie or Aussie mix who is completely blind. She came to us from a shelter in WV where she was picked up as a stray. She was very underweight, but has been gaining weight steadily; there's a possibility she could be a Mini-Aussie as her condition is a congenital birth defect related to inbreeding. In these pictures she is terrified, but she is quite a different dog now. She gets around just fine and she gives the other dogs a run for their money with her constant herding. 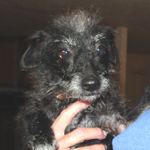 Nikki is a two year old female poodle/schnauzer (Schnoodle) mix who is adorable and tiny (under 10 lbs.). She spent the first part of her life with a hoarder who had too many animals, so when she first meets people she is shy and a little head shy. Once she warms up to her caretakers, though, she is quite comical and very cuddly. She loves stuffed animals and can jump as high as your head. Her foster mom says she's like a Mexican jumping bean. 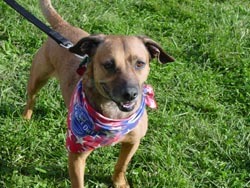 Daisy is a five year old spayed female WONDER dog who loves to play ball and loves squeaky toys. She belonged to a family and lived with them her whole life until she was dropped off at a high volume shelter in WV when the family moved. She is so talented, yet such an easy keeper. She's totally housebroken and also crate trained. We ran her through an agility course on Sunday at an event and she sailed over all the jumps with ease. She is an amazing dog and would be a great only dog as she ignores other dogs so she is not a dog you would get as a friend for your dog, but she's fine with other dogs coexisting. She's about 40 lbs. 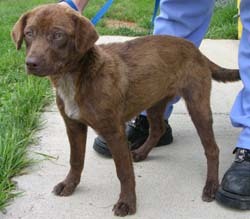 Lilac came to the shelter with her sister Laney who looks nothing like her except for both having docked tails. 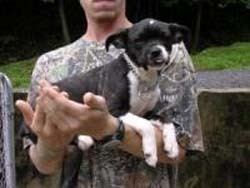 Lilac looks like a Boston Terrier mix, has a brindle and white coat, is approx. 12 weeks old and weighs about 15 pounds. Playful and friendly. Lily is finally here after a long wait. She was abandoned by her owners who were breeders of golden retrievers. They probably left her behind because they couldn't make any money from her given that she's a mix. The poor thing was pregnant and heartworm positive. Our dear friends at Monroe County H.S. treated her for heart worm and spayed her after her puppies were adopted. And our sponsors (YOU) helped us reimburse their expenses. She is heart worm NEG and finally ready for her forever home. You won't find a nicer dog. She's a dream and gets along with the other dogs too. What a sweetheart. If you would like to sponsor Lily, please go to our home page. 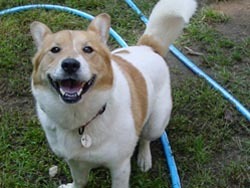 Megan is a very nice five year old female Corgi mix who came to us from WV. She has a gorgeous coat and is a pretty easy going dog. She just underwent surgery for an inquinal hernia so we will be getting some sponsors to cover the vet bills while she recovers. She is a sweet dog who had a life on a chain prior to her rescue so she has low expectations. We would love for someone to love and spoil her so she can live out the rest of her days like the princess she was meant to be. She has a gorgeous red and white coat and appears to have some farm collie in her. This litter is only 10 or so weeks old, 2 boys and 1 girl. Mom is a small sheltie/lab mix and we're not sure about Dad. The litter is small so we're not sure. The female is the black one with blue eyes. The tan one is going home soon, but the other two are available. They were flea infested when they were picked up and a little shy at first but are now friendly and free of fleas although they still need some TLC for their coats. You won't find sweeter puppies than this litter. The black male in the picture is Gonzo and the black female is Polly. 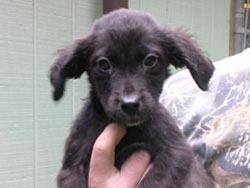 GONZO IS ADOPTED, BUT POLLY IS AVAILABLE! 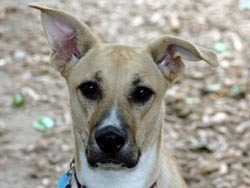 Poni is a 1.5 year old Boxer/Shepherd mix who is in urgent need of an adopter or rescuer. She is still with her owner who was given until October 1 to find her a new home. Poni has severe separation anxiety and is undergoing behavioral modification at Tufts. Owner is willing to provide one session with behaviorist to help with the transition. Poni needs a stay-at-home who can work with her to help her overcome her anxiety issues. She does not crate well. We believe another dog would really help to solve her fear of being alone. She plays well with other dogs and is good with cats. She is a gorgeous dog who looks more like a Great Dane than boxer mix. She loves to chase and be chased; she loves stuffed animals; she is good off-leash and has many redeeming qualities. The downside is she can be destructive if left home alone. The owner does not have a "safe" room to put her in, and is living in a roommate's house so she has to relinquish her beloved friend or move out. 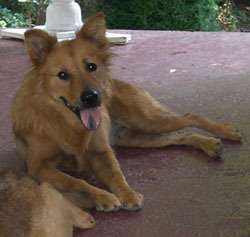 Poni was adopted via another agency. Prissy is a very sweet and mellow girl. She is approx. 5 yrs. old and walks very well on a lead. She would be a great house dog for someone as she's house trained and just likes to lay around or sit outside on the back steps. She weighs 65 lbs. and could lose a couple of pounds. If someone walked her, she would trim right down. 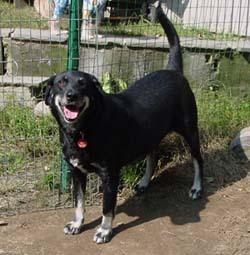 She is good with other dogs but can be a little "bossy" with dogs who jump all over her so she would do best in a home without any other dominant dogs. She is currently kenneled with her friend Brandy. She's got a great personality, is friendly, and loves people. She is already spayed. She is a good girl and will not mess in her kennel. Prissy was seized by a hoarder and held until her court case was settled. She is great pals with Brandy who came from the same household. 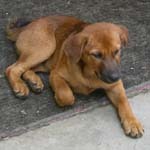 Remington Steal, so named because it is a "steal" to find a dog like this in a rescue group. He is a two year old male wirehaired terrier who comes from champion bloodlines but he was relinquished because he had a flaw and then his new owner had to give him up for health reasons. Despite being bounced around Remington has a great spirit and a solid temperament, is good with other dogs, easy to handle, very playful, just a dream of a dog. He would fit in well in any situation but we do not want him bounced around again, so somebody who can offer a stable environment (no life changes in the near future) and someone who is at home more than not would be our preference. We do not place terriers with small children or first time dog adopters. 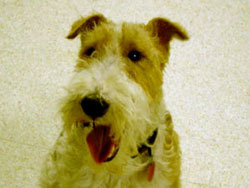 A good article to read is "Is A Fox Terrier Right For Me?" 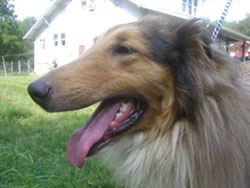 Wally is a beautiful three year old Collie who came in with a little blind border collie, Angel Ray. They were fostered together in WV and he was her seeing eye pal until she got her own home with other dogs, so Wally is available as of this date. Wally was a WV stray, his owners were located and not interested in taking him back. He was not neutered at the time and they let him wander. He is an awesome dog with an amazing temperament. He likes to look out for someone, like another dog or a person. He paces when there's nothing to do, but is gentle enough for kids and loves to play ball. He loves belly rubs, walks and rides. He rides in the car nicely. He seems to like children but he is a little rambunctious outside and might overwhelm a very small child. He's a little sensitive around his ears when you brush him. He is very physical in his affections, and will come and lean on you when you pet him and talk to him. He is a sweetheart and loves to carry things around in his mouth. He is not destructive, though, just likes to carry something around. When he was in his foster home and it was time to let the dogs out, he would let the others go first and take up the rear. What a gem of a dog. 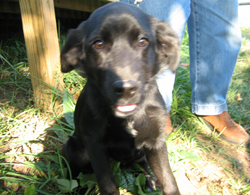 Bailey is a female black lab puppy who is 4 months old and is very sweet and friendly. She was found as a stray and brought to a rescue in WV. 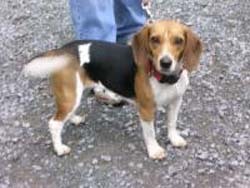 She was fostered in same pen as Cloud and Chablis in WV and will be available after 10/18. 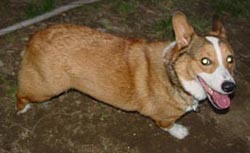 Barley is a neutered 18 month old purebred Pembroke Corgi who lost his home when his owner had a baby. A friend took him but found she didn't have time for him. He's actually a pretty easy dog. He's house trained, quiet in his crate, and extremely cute and playful. He's a good eater, loves to play with toys and is very submissive with other dogs. He also knows some commands and will "sit pretty" on his haunches. 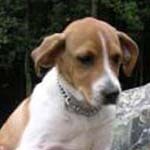 Bubbles is a pure bred little beagle that is approx. 3 yrs. old. She is very friendly and weighs about 20 lbs. She is good on a lead but is a little frightened of other dogs. Her favorite place is sitting on your lap! Bubbles will be available for adoption after 10/3/06. 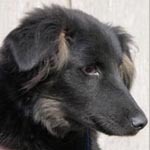 Chablis is about 8 months old (adult teeth), 35#, F, red brown SH coat, labish face, small body; she was picked up by animal control and brought to a rescue group in WV where she was fostered and is coming to MA. She will be available after 10/18.